8 tablespoons unsalted butter, cold and cut into chunks OR use 4 T. butter and 4. T. shortening. In bowl of a food processor, pulse both flours and salt to mix. Add the butter (and shortening, if using) chunks to food processor and pulse to cut in butter. Pulse until you have pea-size clumps. In a smaller bowl or liquid measuring cup, combine water, egg yolk and vinegar. Add the water mixture to the flour mixture and pulse until mixture comes together. I usually end up using all the water mixture plus a little more, but Greg Patent says not to pour it all in at once because you may not need it all. Turn mixture into a bowl and form into a scruffy looking ball. Press it into a disc and wrap in plastic wrap. Chill for at least one hour or until ready to use. When ready to use, bring the dough ball back to room temperature. Roll into a 12 inch circle and use to line a 9 inch pie plate. 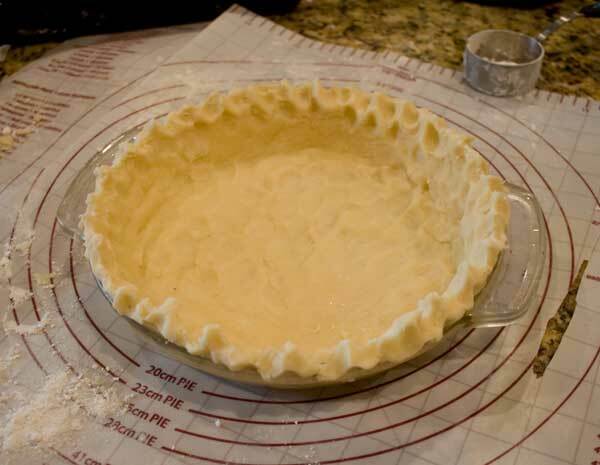 To help prevent shrinkage, chill the lined pie plate before blind baking. I recommend doubling this recipe if you are making a deep dish pie. You'll have dough leftover. To blind bake, press into pan as directed. Poke several holes in the dough with a fork and chill the lined bowl for an hour. When ready to bake, cover with parchment paper, put pie weights (or dried beans) in the center to weigh the parchment down. Bake at 375 for 20 minutes, then remove parchment and weights and bake at 325 for another 20 minutes or until pie shell appears set and is slightly browned.